If you would like to list your harp for free on this page, or for us to actively sell it for you, please contact us to make arrangements. Note: listings on our website are free. If you are interested in buying one of the listed harps and require more details, please feel free to email us or to phone us. Fully restored Erard grecian. Has just undergone a complete restoration, including but not limited to, a new soundboard, new neck, complete reguild and restoration of all mouldings. As well as a complete respray to restore the original colour of the harp. Erard 46 string Gothic. Recently restored by Pilgrim Harps, it has a new neck and soundboard and a new set of bass wires. Good full sound. The mechanism and pedals are in perfect working order. Outer cover and trolley included. A very beautiful Erard Gothic harp which has been completely re-gilded to the highest standards and has had a new neck and a new soundboard in the last couple of years. New neck, freshly re-gilded and in excellent working condition. Comes with tuning keys, inner and outer cover. Will suit a professional harpist, concert quality. Salvi Orchestra Pedal Harp, 46 strings, in mahogany, 33 years old, good sound and in good condition, fully serviced and regulated in 2011. Salvi Orchestra Pedal Harp, 46 strings, maple, 25 years old, great sound and great condition. Includes protective cover, trolley, tuner and some spare strings. Finished in flame mahogany this beautiful harp has an excellent sound and only some minor knocks, it is in excellent overall condition and will last for many years. 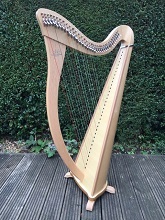 The harp has had a full set of gut strings and several wire strings replaced prior to sale, as well as having a full service. The harp comes with a padded travel cover that is also in very good condition. The harp can be viewed and played by appointment at our High Wycombe workshop. It is in immaculate condition and it has very clear sound. Only a year and half old. Height 121 cm on feet. Weight 11kg. Range 34 strings from 1A to 6C. (6C - 5C wire strings, 5D - 1A Alliance strings) Wood: Body is maple and beach. Soundboard is Spruce. Complete with Camac dust cover and tuning key. Beautiful Niebisch&Tree Blondel 34 string lever harp. Lovely tone and great volume. The harp is in excellent structural condition with only some small scrapes and knocks commensurate with its age. The harp has had a full service and almost complete restring prior to sale. The harp comes with a light dust cover. Lovely early Mark Norris harp with original flag levers, showing some signs of it's age with various small knocks and minor damage but still a beautiful instrument. The harp is structurally sound with many years of playing to go and the traditional Mark Norris sound. The harp comes with an original Mark Norris stand in perfect condition and light travel covers. A beautiful example of a Niebisch & Tree 34 string Glastonbury lever harp. The harp has a loud rich tone and is in almost perfect condition with only the most minor, almost unnoticeable, cosmetic damage. Comes with an almost new padded travel case. This early Grecian harp is in very nice condition and has a delightful sound. It has had a new soundboard and has been regularly serviced. Unusually, it still has the pedal operated “swell” doors.